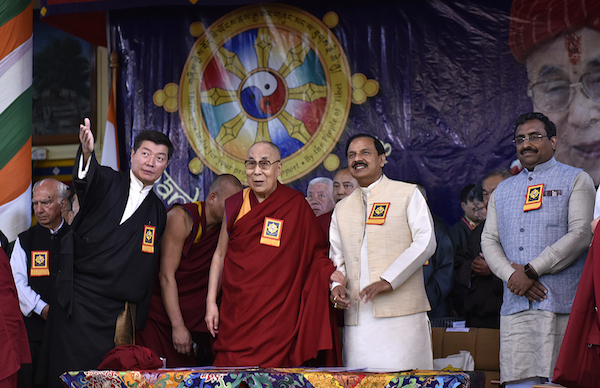 Dharamsala, March 31 (newsin.asia): Despite an official instruction issued by the Indian government to Ministers and officials to stay away from the “Thank You India” function organized by the Tibetan spiritual leader Dalai Lama in order not to annoy China, the Union Minister of Culture, Dr.Mahesh Sharma, attended the function held here on Saturday. 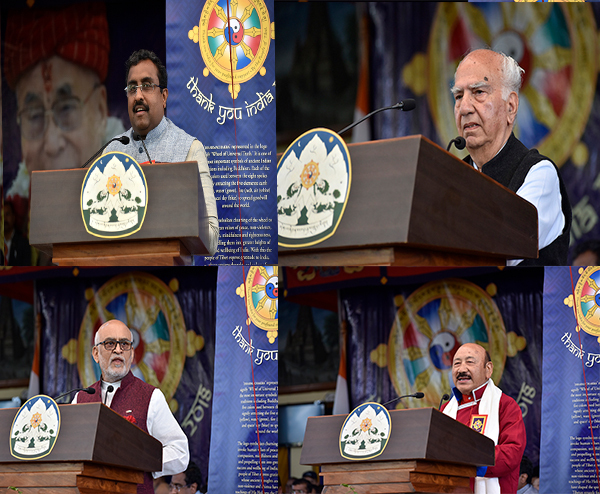 According Central Tibetan Administration, the BJP General Secretary Ram Madhav; Congress party Member of Parliament Satyavrat Chaturvedi; and Ms Tsering Dolma, wife of Shri Pema Khandu, Chief Minister of Arunachal Pradesh, were among the 4000 gathered here to mark 60 years since the Dalai Lama arrived in India seeking refuge after the Chinese took over Tibet in 1959. A special guest at the event was Naren Chandra Das, the lone surviving soldier of the Indian army battalion which received the Dalai Lama when he first stepped into Indian territory in 1959. Das was felicitated at the function by the Dalai Lama with an Ashoka Chakra ,India’s national as well as a Buddhist emblem. Addressing the gathering, the Dalai Lama said that he views his flight from Tibet with a mixture of sadness and happiness. “Tibetans should not be complacent. We need to see where we are making mistakes,” the Dalai Lama said. “On the other hand, we should thank His Holiness the Dalai Lama for the harmonious blend of Indo-Tibetan religion and culture. Tibetans and Indians can now be described as a flower and its fragrance, which cannot be separated,” he said. “I was just a child when Tibetans started coming into India. The Indian people welcomed them like family, sending a message of peace and love to the entire world. Since then, His Holiness the Dalai Lama has been promoting the same message of peace, representing the values of India and Buddhism,” he added. “We accept you as an integral part of India and at the same time, pray for your successful return to your Homeland. 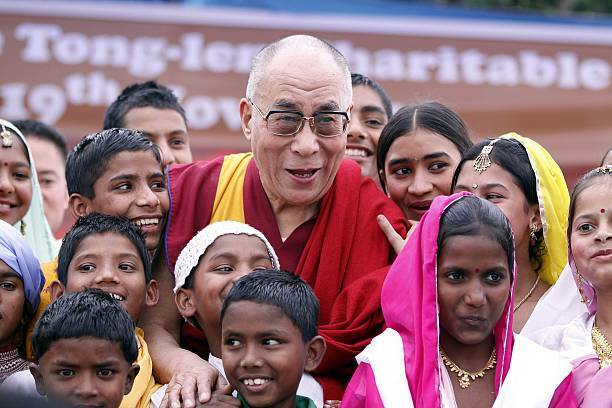 The Indian people are committed to serving the Tibetan cause led by His Holiness the Dalai Lama. Our Prime Minister Narendra Modi remains concerned about the Tibetan people,” Sharma said. Ram Madhav, General Secretary of Bharatiya Janata Party (BJP), said that India has always welcomed different communities with open arms and an open heart. “We as a country have hosted many different people in history such as the Parsis, Jews, who came to India and found love, peace and shelter,” Madhav said. “India is the land of the Buddha, India is the land of Mahatma Gandhi, and for the last six decades, India has been the land of His Holiness the Dalai Lama, the most knowledgeable living spiritual guru in the world,” Ram Madhav said. The BJP leader called for the resolution of the Tibet issue through peaceful and democratic means based on dialogue to facilitate the honorable return of the Tibetan people to Tibet. Satyavrat Chaturvedi, a Member of Parliament from the Congress party, said the ‘Thank You’ event was both amazing and curious. “India and Tibet are linked, not just through borders, but through the rich culture and spirituality of Nalanda. Such relations support each other in times of need. Under the circumstance, when His Holiness and the Tibetan people came to India, it was India’s sacred duty to host them. So we just fulfilled our duty by welcoming His Holiness the Dalai Lama. Therefore, every one of you is our special guest and a part of our family,” the Congress MP said. Former Chief Minister of Himachal Pradesh Shanta Kumar who is the convener of the All Party Indian Parliamentary Forum for Tibet, said that Tibet and India are two countries but one in spirit and soul. 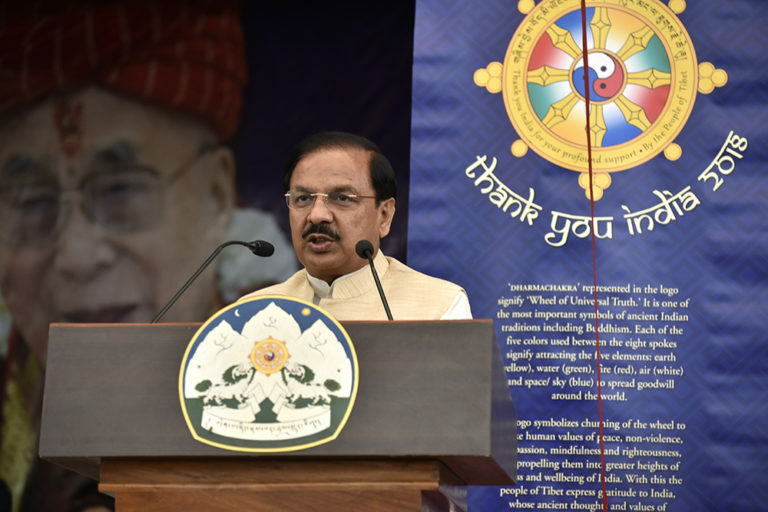 He thanked His Holiness the Dalai Lama for making Dharamsala world renowned for peace and compassion. He called upon China to allow the dignified return of the Dalai Lama to Tibet. Kumar said this will not only fulfill the aspiration of the Tibetan people but will also earn new respect for China as a country. “India was, and has remained, the greatest supporter of Tibet. And I hope that India retains its unparalleled support for Tibet until our aspirations are realized,” Sangay added.